Carl Jung, a Swiss psychoanalyst who was active during the early 1900s, devoted much of his time and energy to understanding symbols, which he referred to as "archetypes". Jung believed that archetypes consisted of images and ideas that developed out of the collective unconscious, a space of shared understanding to which all humans had unconscious access. Under Jung's understanding, symbolism is inherited and develops without our knowledge or effort. For him, the key was in understanding the already active symbols in our lives. I find this idea fascinating, but I would also argue for the benefit of a more intentional symbol making process. Instead of letting our symbols find us, I believe that we also have the power to choose images and instill them with meaning for ourselves. This can happen on a conscious level and has the capacity to hugely benefit the self care process. Throughout this month, I'll be exploring how various symbols can be used in self care, but I would encourage you to be on the lookout during your daily routine to discover or rediscover symbols in your own life that will encapsulate something unique and personal about your individual self care experience. A symbol that first emerged in Ancient Egypt, the Ouroboros is a serpent eating its own tail. Originally this symbol was designed to represent the cyclical nature of life, however, since its original use this it has come to mean various things to many other cultures and religious groups; to some it stands for immortality, to others it represents self destruction. The interpretation that best fits with the purpose of self care is one of introspection. The snake is eternally devouring itself, hinting at ceaseless self exploration and development. It is self sustaining. We too can nourish ourselves and gain energy from our own beings. In order to do this, we need to know ourselves well and engage in a positive relationship with ourselves, regarding our thoughts and feelings as important and worthy of our attention. To engage with ourselves in a way that promotes introspection we might try journaling or other forms of expressive art. Runes are letters in an ancient alphabet, dating back to 150 AD. Many runes represent ideas and values that were important to the people of that time, including themes related to nature, harvests, journeys, and Norse gods. The rune above is Inguz, and it holds many meanings. It represents the god Freyr who is the embodiment of fertility. Inguz is shaped like a seed, a tiny thing with the potential for great life. In terms of self care, this may relate to fertility of mind. We have all experienced times of boredom; we understand how stagnant and uncomfortable it feels to be uninspired. The symbol of Inguz may be used to help us remember to seek out inspiration and dedicate ourselves to a purpose. It feels good to be a part of something from beginning to end, whether it's following through on a creative project, trying a new recipe we've thought up, or expressing an idea or viewpoint and what it means to us. Inguz can help remind us to use self care to cultivate and grow our seeds of enlightenment, and to share them with the world. Mandalas have long been used in Buddhism as an aid in meditation and a tool for teaching concepts of the religion. The basic form of most mandalas is a square with four gates containing a circle with a center point. Traditionally, this image has represented a microcosm of the universe. More recently, it has also become common in clinical practices to use mandalas for art therapy, in which case the symbolism becomes more personalized depending on the patient creating the art. In these cases, the underlying symbolism in the mandala image is the idea of harmony. Both the process of creation and the view of the completed work promotes a sense of balance and peace through the use of mindfulness. While coloring the mandala, the present moment is at the forefront. Making decisions about which colors to use and paying attention to the small details of the work requires a very present focused mindset, in which thoughts about the past and the future fade away. Growing the ability to be mindful is essential to self care. 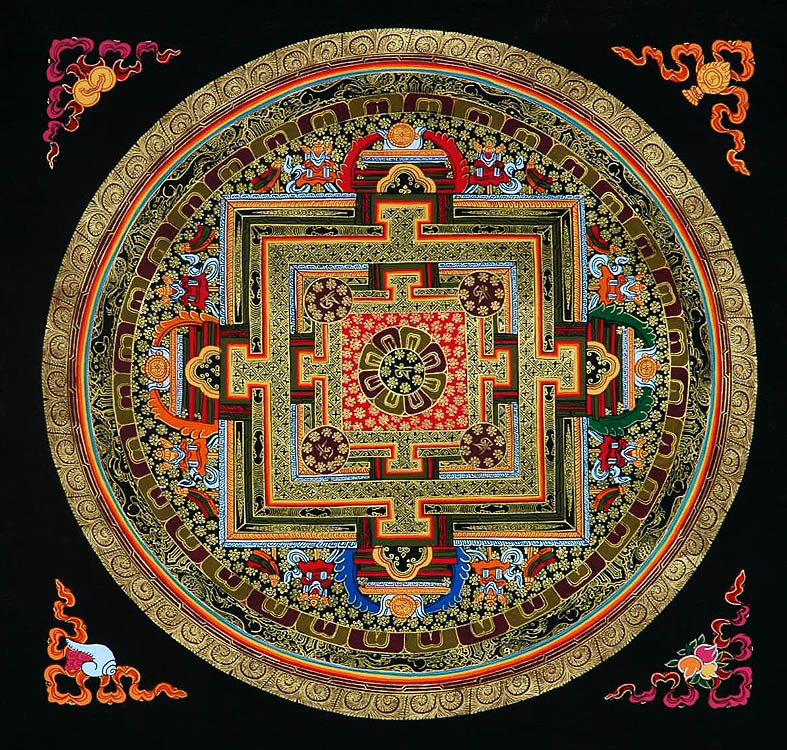 Creating a mandala with mindfulness, and regarding it as a completed whole afterwards, helps to promote a sense of harmony with oneself and with the world. If connecting to mandala symbolism appeals to you, there are lots of mandala coloring books available, as well as free printable coloring pages you can find on the internet. A symbol used in ancient Iceland, the Vegvisir is still very relevant today. Its original purpose was as a sort of magical compass, used to protect travelers and help them find their way home in rough weather. Now, wearers of this symbol - like Icelandic singer Bjork, who has it tattooed on her arm - can rely on the Vegvisir to lead them home on an emotional and spiritual level. What makes you feel at home? Beyond a geographic place, are there activities or hobbies in your life that help you feel at home in yourself? Perhaps this symbol can remind you to engage in the type of self care that allows you, regardless of your physical location in the world, to feel wholly and comfortably you. This is the alchemical symbol for gold. There are dozens of philosophies about the practice of alchemy; many of them rely on either chemistry, magic, or myth in their interpretation. The one I find most interesting, however, is the view of alchemy from a psychological standpoint. Carl Jung, who I mentioned in the introduction to this post, believed that ancient alchemical ideas about transforming base metals into gold can be applied to humans. Instead of a purely physical transformation, the human-based practice would involve an emotional alchemy. Jung called this process "individuation" and considered the final stage to be a fully realized sense of self. To have gone through this alchemical process of individuation means that we have looked at every aspect of ourselves, our personalities, and our lives and we have accepted them as a part of who we are. This should bring about a sense of self actualized happiness, contentment, and peace. Do you relate to any of the symbols described above? Think about your own use of symbolism and how it relates to self care; are there images or objects that could help you remember an aspect of self care that is important to you? I would love to hear from you in the comments below!